All-Russian Athletic Competitions « Isinbayeva Cup » will take place in Volgograd for the fourth time. This competition that has already become a tradition gathers 14 and 15-year-old athletes from different corners of Russia. The participants compete in various sporting events which are 100 m run, 200 m run, 400 m run, 800 m run, 1500 m run, 110 m hurdles, 300 m hurdles, relay race 4x100 m, long jump, triple jump, high jump, shot put and pole vault. Athletes older than 14 and 15 years old are allowed to participate in the pole vault discipline. This year 700 people will compete for the Isinbayeva Cup. They all will come from the Volgograd, Arkhangelsk, Lipetsk, Yaroslavl, Astrakhan, Rostov and Saratov region, from the Republics of Crimea and Tatarstan and from Stavropol and Krasnodar krais. “I am so happy that we have this possibility to organize again Isinbayeva Cup! These competitions are very important to me. The development of sport and promotion of a healthy life style allows us to involve more children and young people into practicing sport and athletics. I would also like to expressly thank our partners that find money for the support of these important competitions.” – said Yelena Isinbayeva, two-time Olympic champion and President of Yelena Isinbayeva Charity Foundation. 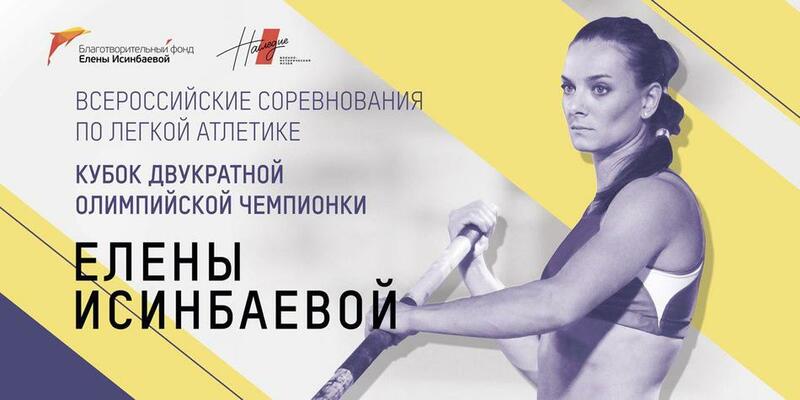 Isinbayeva Cup, organized by the Charity Fund is part of the program “Our support-their victories!” aiming to encourage practicing athletics among children, increase sports mastery of young athletes and to promote pole vault event in Russia. This year Isinbayeva Cup will be organized under support of the Museum of Military History “Naslediye” (Heritage). Every participant of the competitions will receive a t-shirt, a number of participant, a backpack and a power bank. Athletes that set records will be awarded with medals and the winners will receive sporting prizes made of glass, medals, and gift certificates for sports equipment. The total prize money is 484 thousand rubles. Since 2015 every year more than 500 people take part in the Isinbayeva Cup, held at the athletic stadium of the Volgograd State Academy of Sport. All the participants of the competitions will receive the official starting kits with souvenirs from the fund, and the winners will be awarded with medals, certificates, prizes and gift certificates for sporting equipment. Yelena Isinbayeva and other Olympic champions Yelena Slesarenko, Tatiana Lebedeva, Maksim Opalev and Larisa Ilichenko will award the winners personally. Other honorable guests took part in the awarding ceremonies of previous years: Joël Bouzou, President and Founder of the International Association “Peace and Sport”, President of the World Olympic Association, advisor to H.S.H. Prince Albert II of Monaco, bronze Olympic medalist pentathlon (1987); Colonel Mikhail Barishev, Head of the Central department of Work with Personnel of Russian Armed Forces; Aleksandr Nazarov, Vice-manager of the “Rostech” state corporation; Head of Volgograd Andrei Kosolapov and others.